The American southwest is known for its dramatic landscapes, with spectacular archaeology to match. Ancient pueblos of stone and adobe mud can be found throughout the area, often in quite picturesque settings. The greatest concentration of pueblos, however, can be found in Chaco Canyon, an area now designated Chaco Culture National Historical Park in north-western New Mexico. Along a fourteen kilometre stretch of the canyon and over a period of about four hundred years, the ancient inhabitants built the most exceptional group of peublos in the area. And then towards the end of the 11th century, a group of Chacoans migrated north to the Middle San Juan River area – building typical Chaco-style great houses that can be seen at Salmon and Aztec Ruins (nothing to do with the Aztecs). 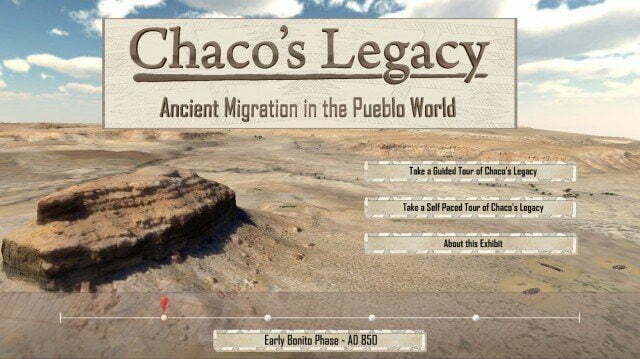 Chaco’s Legacy, combines recent archaeological research with virtual reality technology to enable visitors to the Salmon Ruins Museum and Aztec Ruins National Monument a better understanding of the Chaco phenomenon. Pueblo Bonito, the largest Chacoan pueblo. When it comes of ancient cultural landscapes, there are few I find more fascinating than Chaco Canyon. Throughout the canyon there are hundreds of small pueblo dwellings, numerous circular ceremonial kivas and a number of rock art (petroglyph) sites. But it is the extraordinary ‘great houses, of which there are twelve such as Pueblo Bonito, Nuevo Alto and Kin Kletso, for which the archaeology in the canyon is most well known. Like many cultural landscapes, I feel you really do have to visit Chaco Canyon to appreciate fully the shear scale of these sites, and their relationship to one another. And then have some understanding of the complexity of Chaco society. 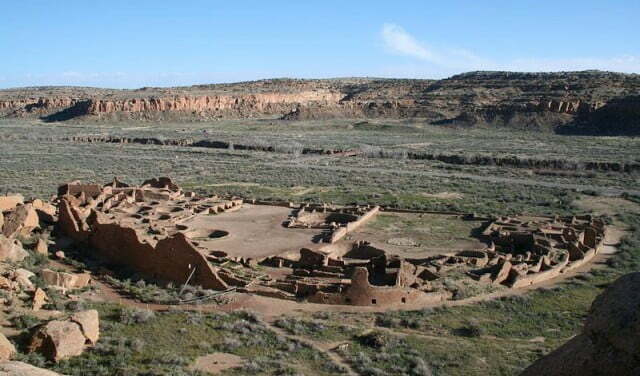 Now, visitors to Salmon Ruins Museum and Aztec Ruins National Monument can experience Chaco culture in a new way. Archaeology Southwest, a non-profit organisation involved in the conservation and presentation of the archaeological past (see their Archaeology Southwest Magazine), in collaboration with a leading Chacoan archaeologist – Paul Reed, and using the photography of renowned aerial photographer Adriel Heisey, has produced a digital model of the canyon and its archaeology, as well as the Chaco great houses to the north at Salmon and Aztec. 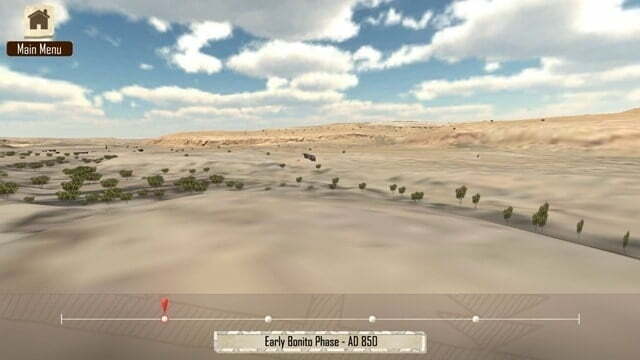 In this project, funded by the US’s National Science Foundation, Archaeology Southwest has developed a Chronological Virtual Reality tool that is specifically designed to present the multiple levels of archaeological research from the landscape, to individual sites and the artefacts recovered. 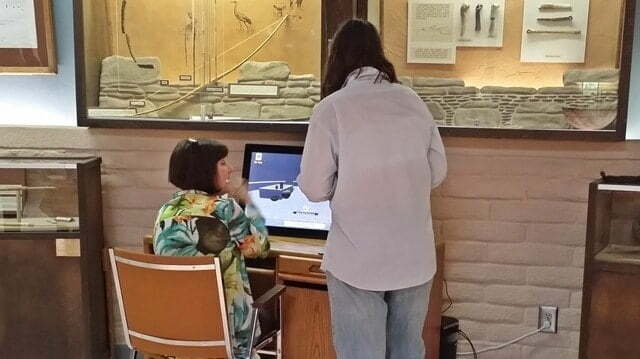 Then, working alongside a virtual reality game engine, they have produced guided tours of Chaco archaeology, which is experienced in the form of a digital video via a touch-screen terminal placed within the museums. Although the application is only available to visitors to Salmon Ruins Museum and Aztec Ruins National Monument, the producers are also thinking ahead to how the application can be distributed and experienced more widely. For now, a copy can be requested for educational purposes. But there is the possibility that the entire project, or smaller subsets of it, may be made accessible on the internet – running within a webpage as opposed to requiring users to download the application before running it on their computers. In the meantime, you have the perfect excuse to head to the two museums. My experience of 3D/virtual gaming is quite basic. In fact, apart from a Gameboy version of Lara Croft that was a Christmas present, my experience of computer/internet games has probably not progressed that much from the first generation of computer games – table tennis I think it was. 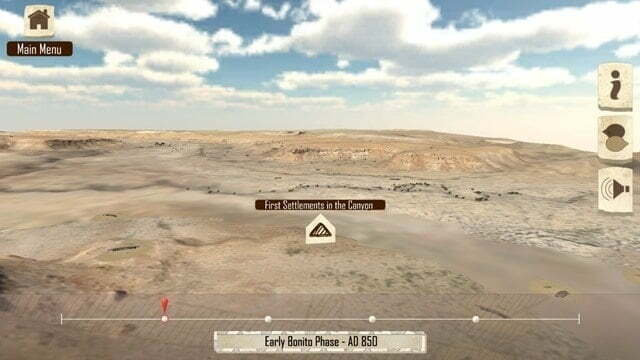 So I am easily impressed with 3D, computer generated models of archaeological sites. Most of the 3D reconstructions I have seen have been of Classical sites from ancient Europe. So it was a delight to be able to take a sneak preview of Chaco’s Legacy before it was launched on 5 June 2014. From the start screen there are two options, a guided tour – which starts with a few early pueblos, leading on to Pueblos Bonito and then heads north to Aztec Ruins and Salmon Ruins. Moving through the canyon and then beyond it, this guided tour provides a brief overview of the Chaco phenomenon: its development within the canyon and then the migration north of Chacoans to the Middle San Juan River area. A much more interactive experience can be had by choosing the ‘self-guided tour’. Although self guided, there is still a structure that allows users to follow a logical route in exploring the archaeology of Chaco culture. 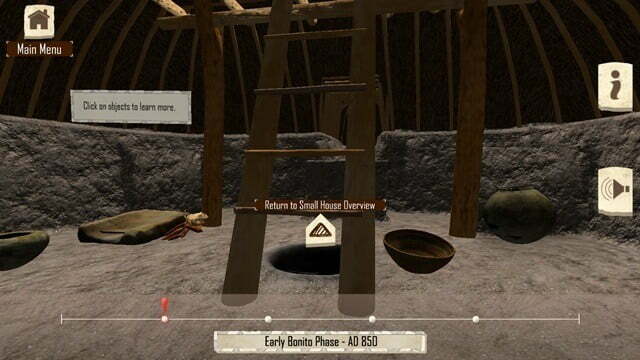 Also, it is possible to explore a bit more of the structures at each site, users can enter underground pit houses and kivas, and interact with the artefacts shown in them. And of course users can proceed at their own pace, going back if necessary. The following series of screencap images is far from representative of all that is on offer, but they do give an idea of what is on offer. An overview, before going on to explore the first settlements, dating to between 700 and 900 AD. At each ‘reconstructed site’ there is an audio commentary (also available in text form) about that particular site. Once this is finished, users are given the option of either exploring more or going on to the next point of interest – as you explore deeper into the canyon and Chaco culture there are more options. For example at the site above, before continuing to Una Vide Pueblo, user can enter the underground kiva. Once ‘inside’ the archaeological feature, here an early pit-house, users are able to click on the artefacts to learn more about them. These early pit houses were used as a living room, kitchen and a bedroom – whereas later kivas were purely ceremonial. 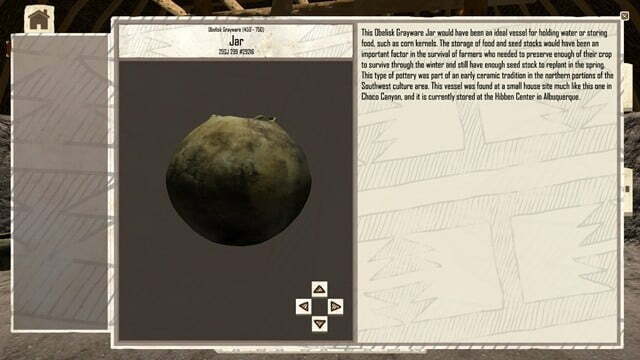 The artefact itself is in 3D and can be rotated, using the onscreen arrows to turn the object. ‘Flying’ above the canyon between the sites – look out below as you will see the remains of other sites! Pueblo Bonito – the largest of of all the Chacoan great houses. Constructed with four stories, in some area there might have been five levels, there are about 700 rooms, 32 kivas – with three great kivas. Bearing in mind this application is intended to be used at a terminal within a museum display, the authors and creators have struck a good balance. 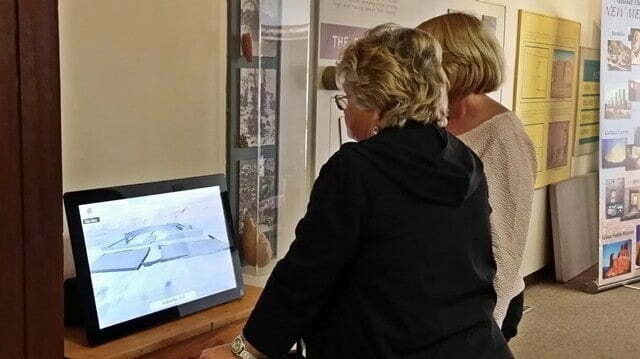 The the content included, the manner in which this information is put across, and the speed with which the virtual tour moves through the landscape, all come together to make for an interesting and informative overview to the archaeology of Chaco Canyon and beyond. 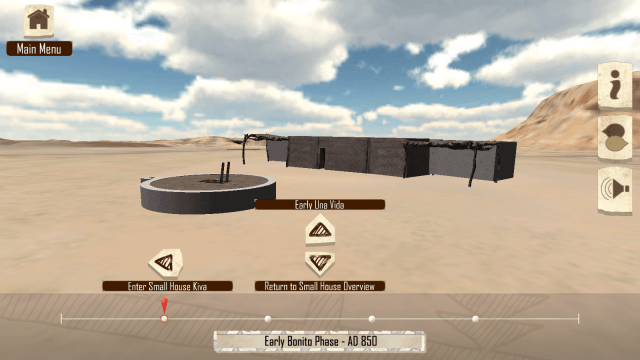 If the ‘guided tour’ is a good introduction, choosing the ‘self paced tour’ takes users deeper into Chaco archaeology, literally – well, as literally as you can get within the context of a virtual environment. At their own pace, users get the complete 400 year story, as well as being able to enter certain architectural features (underground pit-houses, great kivas) and get an idea of what these might have looked like in the past. 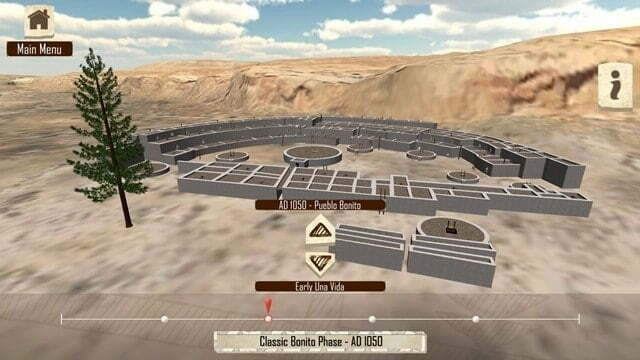 To many of us, Kivas are so alien, and so to be able to ‘enter’ a 3D reconstruction really does help to flesh out the circular, open pits we see at many archaeological sites in the American Southwest. Doug Gann, of Archaeology Southwest and creator of the virtual reconstructions, tells me that the current version of Chaco’s Legacy is just the start. Now that they the Chronological Virtual Reality System functioning in such a way that it can support a guided tour through the artefacts and architecture of four different time periods, there are very few limits on what the team will be able to do with the application next. First up, is to add multiple language support. Also, there are so still so many sites in the canyon to to record and interpret – this application is only the tip of the ice berg, so to speak. The next site to be added will be Pecos Pueblo. 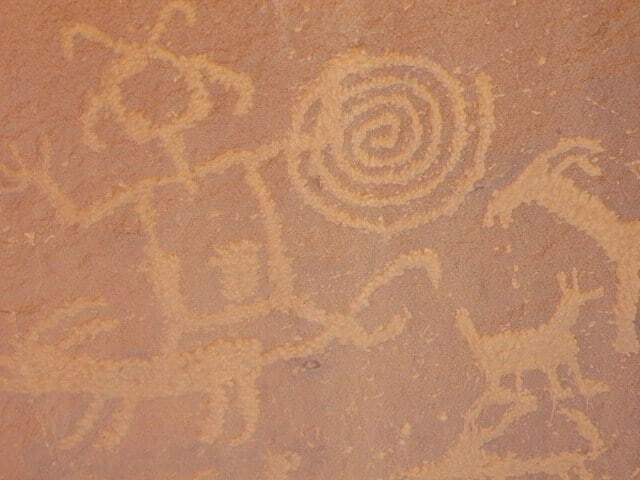 And hopefully some of the wonderful rock art sites will be added in the not too distant future. 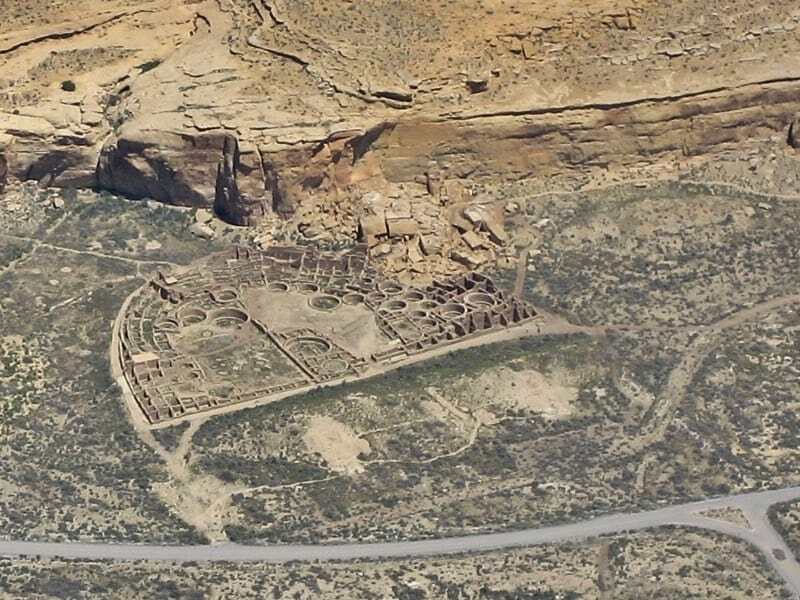 Chaco’s Legacy tells a great archaeological story, and I am sure it will do much to inspire the museum visitors to explore the Chaco phenomenon further, in the real world of the nearby ruins and Chaco Canyon. I think one does have to visit Chaco Canyon to appreciate all its wonder; it is a place like no other. I took my daughter last year and have become totally obsessed with the ones they called “Ancient Enemy”. Ah yes Chris, I had forgotten that the word Anasazi also means ‘ancient enemies’.